Comments Off on UMass Boston Professional Etiquette Dinner – 7 open seats for today! UMass Boston Professional Etiquette Dinner – 7 open seats for today! Students are invited to attend a professional etiquette dinner, complete with a discussion on professional presence. Learn how to introduce yourself, provide introductions, initiate conversation, and learn when and when not to eat. Attending this event will provide you with a useful set of tools you can utilize in situations where your professional relationships are developed and strengthened in social settings. You will gain knowledge on a variety of areas, including the do’s and don’ts of dining, conducting business in a social setting, how to excuse yourself from the table, how to manage eating difficult foods, farewells, and more! At the etiquette dinner you will be guided through eating a challenging four course plated meal with fine china. The etiquette dinner will be led by Judith Bowman, founder of Protocol Consultants International. Judith is one of the country’s leading authorities on corporate etiquette, international protocol, dining, networking, behavioral styles and presentation skills. Students must be able to attend the full event, from 4pm-6:30pm on Tuesday, April 29 in the Ryan Lounge (M-3-721). Students who register and do not attend will be charged a no-show fee of $10. If you are interested and can attend the whole time (4pm-6:30pm), please email Jennifer.Barone@umb.edu to RSVP. Spots will be filled on a first-come first-served basis. Dress is business casual or business professional attire. Please see below for more information. These are the MAP Events for the week of April 27, 2014. Beta Gamma Sigma Presents: Stress Management and Relaxation: Starts at 10:00 AM in CC-2-2540. MAP Miles earned: 50. Personal Market Pitch: Starts at 3:00 PM in H-11-0011A. MAP Miles earned: 50. Networking Event: Starts at 4:00 PM in the Alumni Lounge (CC-2-2540). A response is required for this event. MAP Miles earned: 100. Three fantastic opportunities to be a student leader in the College of Management for the 2014-2015 Academic Year! These are the MAP events for the week of April 20, 2014. Cover/Thank you Letter Workshop: Starts at 1:00 PM in H-11-0011A. MAP Miles earned: 50. MSBDC– Getting Started in Business: Starts at 6:00 PM in Central Library, Copley Square 700 Boylston Street, Boston, MA, in Conference Room 05/06 (lower level of library). A response is required for this event. MAP Miles earned: 100. Resume Presentation: Starts at 1:00 PM in H-11-0011A. MAP Miles earned: 50. Change Management and Resilience: Starts at 3:00 PM in CC-3-3540. MAP Miles earned: 50. Global Supply Chain at Target: Starts at 7:00 PM, location to be determined. MAP Miles earned: 50. These are the MAP events for the week of April 13, 2014. Beta Gamma Sigma Presents: Exam Preparation: Starts at 11:00 AM in H-11-0011A. MAP Miles earned: 50. Career Services: Green Career Search: Starts at 1:00 PM in H-11-0011A. MAP Miles earned: 50. Personal Market Pitch: Starts at 1:00 PM in H-11-0011A. MAP Miles earned: 50. Hailo: The Taxi Heaven: Starts at 3:00 PM in H-11-0011A. MAP Miles earned: 50. 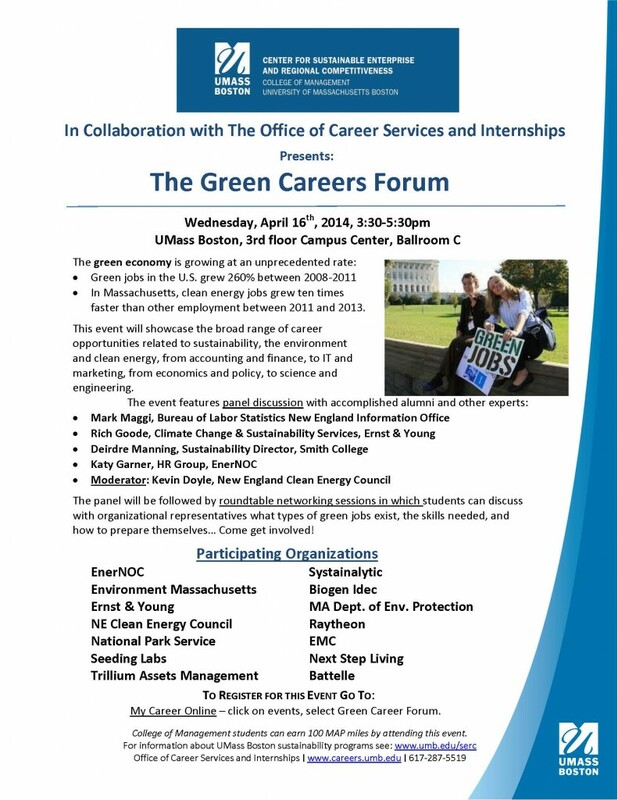 SERC Green Careers Forum: Starts at 3:30 PM in CC-3-Ballroom 3. There is a response required for this event. MAP Miles earned: 100. 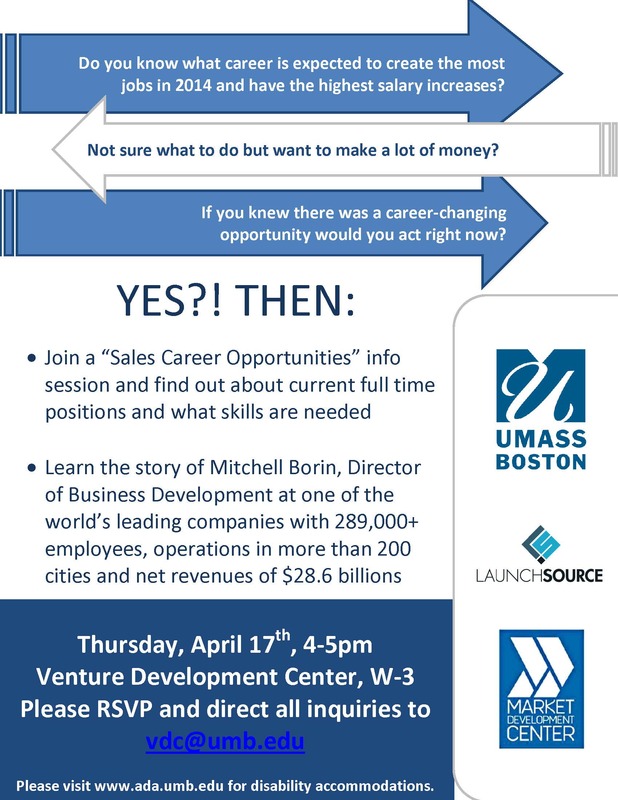 Sales Career Opportunities Information Session: Starts at 4:00 PM in the Venture Development Center. MAP Miles earned: 50. Check out the latest opportunities with the following companies on the Career Services page! These are the MAP Events for the week of April 6, 2014. MSBDC–Business Finance and Accounting Basics: Starts at 4:00 PM in the Quincy Center for Innovation, 180 Old Colony Avenue, Quincy, MA 02169. A response is required for this event. MAP Miles earned: 100. State Street Company Tour: Starts at 10:00 AM in State Street HQ, South Station, Boston, MA. A response is required for this event. MAP Miles earned: 75. On Campus Interviewing Prep: Starts at 2:00 PM in CC-1-1110. MAP Miles earned: 50. Developing Essential Networking Skills: Starts at 11:00 AM in H-11-0011A. MAP Miles earned: 50. Beta Gamma Sigma Presents: Exam Preparation: Starts at 9:30 AM in H-11-0011A. MAP Miles earned: 50. Linked-In–What you need to know, and how to make the social network work for you: Starts at 11:00 AM in H-11-0011A. MAP Miles earned: 50.